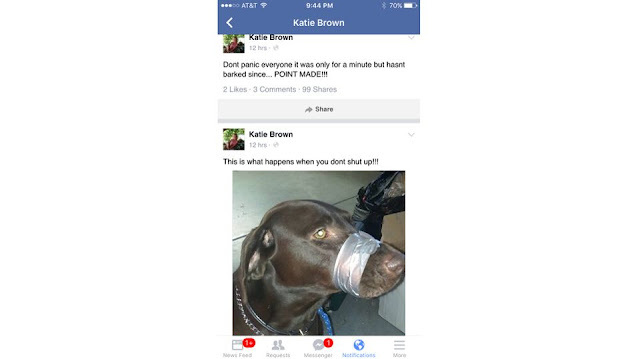 Have you heard about the Florida woman who tapped her chocolate labs muzzle shut because it wouldn't shut up? My facebook blew up Saturday with people sharing it and demanding she be investigated. I think at one time South Daytona Florida officials were saying they had received about 32,000 calls people demanding something be done. I am so happy to see that South Daytona took the calls and emails seriously and tracked her down. It would have been so easy for them to blow it off. There seems to be two camps to this story. Camp 1 is She is a dog abuser that needs the max sentence a animal abuser can get. The second camp is the the other pics on her fb page the dog looks happy and healthy and she probably just made a really stupid mistake and shouldn't have shared it to the world. I bet you can guess where I fall. There is absolutely NOTHING that pisses me off more than people treating their animals badly. Look at the poor babies eyes. The hurt is so evident it makes angry. You may remember that I adopted Max from a shelter and he came from a pet hoarder situation. Today he is very well adjusted. He loves the other animals and doesn't run into another room with his food so he can eat alone. He's a totally sweet heart. His blind eye rarely gives him trouble. I don't know what exactly happened in his past home, but I know he had some emotional and obviously physical issues when I got him. Dogs love us and trust us completely. We need to do the same in return. I have always said no one has ever loved me like my dogs love me. They are always happy to see me when I come home. They are always up for snuggling with me, or going for a walk AKA me carrying them around the neighborhood. They never get sassy. They are lazy and sometimes bark for no reason, and love to play revolving door going out and back in 200 times, but the joy they give me is worth all of that. Whats your thought, stupid mistake or abuse?